How to improve Wi-Fi performance? - DrayTek Corp. If your Wi-Fi speed is slow or you get disconnected quite often, you may try the following to improve the Wi-Fi performance of Vigor Router or VigorAP. It might be that the channel that the AP or router is using is too crowded and thus has a lot of interference. You may use AP Discovery function to check the nearby AP and the channels they're using, then use a channel that is less used by the others. 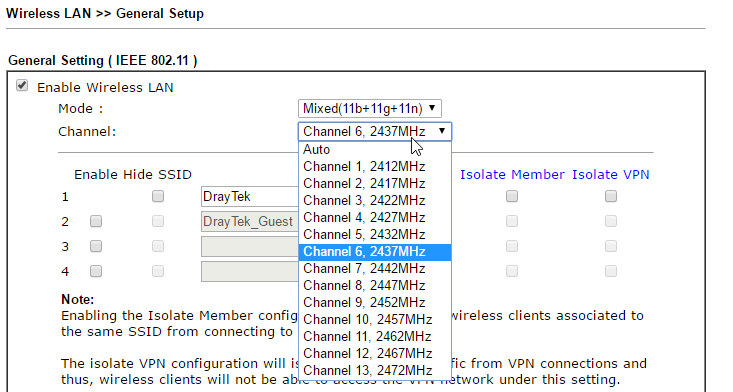 Channel can be set from Wireless LAN >>General Setup page. By default, the wireless channel bandwidth is set to 20/40MHz which means the router or AP will transmit data on two channels at the same time to get a better throughput (for more details, visit here). However, if the environment has a lot of interference, it would be better to stay on a single channel that is less crowded. Channel Bandwidth can be modified from Wireless LAN >> Advanced Setting page on Vigor Router, and Wireless LAN >> General Setup on VigorAP. RTS (Request to Send)/CTS (Clear to Send) is a mechanism to reduce collision among stations, but using RTS/CTS will add more overhead; therefore, by default, RTS/CTS will only be activated when transmitting a packet which is larger than 2347 bytes. In the environment that has plenty stations which may be far apart from each other, you may lower RTS threshold to several hundred bytes so that RTS/CTS will be implemented more often. RTS threshold may be modified from Wireless LAN>> Advanced Setting. If there's a legacy device or a device of which signal strength is really weak, they will slow down the whole network because the access point would need to spend more resources on them to transmit the equal amount of data. In such case, Airtime Fairness can be the solution. If there are plenty of wireless clients on the network and some of them might be really far away from the AP or using a legacy device, you may enable Airtime Fairness to prevent other clients from being delayed by those slow ones. Airtime Fairness can be enabled from Wireless LAN >> Airtime Fairness page. First, make sure the antennas are connected firmly to the router or AP, then tweak the direction of the antenna to make a better signal. Walls, ceiling, doors, and cabinet will all decrease the wireless signal, make sure the router or AP is placed at where there are no obstructions between them and the wireless clients. And note that except for other access points, a microwave oven, cordless phone, and Bluetooth equipments are also operated on 2.4G channel and therefore are possible interference, you might have to keep the router or AP away from those appliances. See also: The wireless signal is strong, but why can't I access the network? 13How to improve Wi-Fi performance? has been viewed------ 13 ------times.